I'm not fully vegetarian but i like the philosophy. Sometime i try vegetarian diet, but the society and life style we live in sometime make it hard to be one. Never the less i'm giving it a serious thought and came across some very good reference on the topic. Good perspectives. Vegetarianism in the religions of the world. I would like to begin with Semitic Religions and first of all I shall begin with Judaism. Judaism: Judaism is the mother of all Semitic religions, i.e Judaism, Islam and Christianity. These three religions are also called Abrahamic religions, as Abraham is the founding father of all these religions. The Talmud interprets dominion as the privilege of using animals for labour only. Rabbi Kook states that dominion does not mean to govern cruelly for our personal selfish ends with stubborn heart. Rabbi Hirch says that people have not been given right to have other animals subservient to them. He also states that “The earth and its creatures may have other relationship of which we are ignorant, in which they serve their own purpose. Thus there is divine control over all and neither Judaism nor any other religion has unlimited rights to use, misuse or even kill other animals. The dietary regulations of Judaism: It is interesting to note that all dietary laws of Judaism apply to flesh food only. All fruits, vegetables, grains, cereals and even dairy products are KOSHER. Only meat must be prepared in a special way. This is because Judaism stresses to minimize meat eating. Meat is not for consumption. It is a compromise in a dire need. Jewish dietary law ‘kushrut’ says that first of all eating meat itself is a sort of compromise. Man ideally should not eat meat. Further the Jewish laws prescribe a long and tiresome almost difficult procedure to slaughter animal. If such procedure is not strictly followed the slain meat becomes impure and it is not ‘kosher’ (permissible). This is an indirect restriction on slaughtering and meat eating. Christianity: “Take care not to destroy god’s work for the sake of something to eat” (Romans 14:20) The New Testament focuses exclusively upon Jesus but little is known about his diet. There were however many early Christians who did support vegetarianism. They are St.Benedict, Clement, Eusebius, Cyprian, and John Wesley to name a few. The Bible –including the Old Testament has its origin in Judaism and by virtue of Torah’s declaration of vegetables as first food the vegetation becomes the food of Christianity also. History relates that organized Christianity gradually moved away from its vegetarian roots. The early Christian fathers adhered to meatless regimen. More recently the Roman Catholic Church had ruled that practicing Catholics at least observe certain fast and abstain from meat eating on Fridays. This is a welcome step in the direction of meatless food society. Islam: The Islamic tradition holds that in Mecca, the birthplace of Mohammed, no creature be slaughtered and that perfect harmony exists between all living things. In fact, Muslim pilgrims approach Mecca wearing a shroud (ihram), and from the time they don this religious apparel, no killing is allowed: not even mosquitoes, lice, grasshoppers, or any other living creature. If a pilgrim sees an insect on the ground, he will gesture to stop his comrades from inadvertently stepping on it. Thus, while Islam is not generally viewed as a religion that endorses vegetarianism and kindness to animals, the Islamic tradition does have great deal to say about a person’s relationship to the animal world. 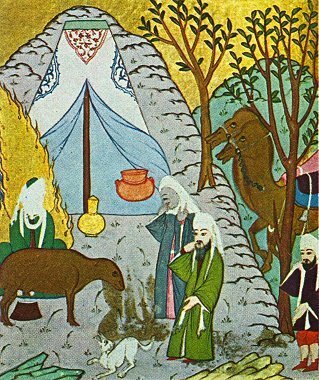 The Example of Mohammed: Biographies of Mohammed (also written as Muhammad, peace be upon him) include narrations that clearly depict his love for animals. And while one would be hard-pressed to find Muslims today who feel that their religion supports vegetarianism. (Although there are certain sects that do), Mohammed’s teachings in this regard are clear. For instance, Margoliouth, one of Mohammed’s chief biographers, writes,”His humanity extended itself to the lower creation. He forbade the employment of towing birds as targets for marksmen and remonstrated with those who ill-treated their camels. When some of his followers had set fire to an anthill, he compelled them to extinguish it. Act of cruelty was swept away by him.” Other biographers, such as Dr. M. Hafiz syed, point out that Mohammed instructed those who eat meat to wash out their mouth before going for prayer. While it is certainly a Muslim custom to clean one’s mouth before going to prayer, many biographers say that only meat is emphasized in this connection and not any other food. To a vegetarian Muslim, this would come as no surprise. Why, it may be asked, did Mohammed allow meat eating at all? One possible answer is that, because he based much of his teaching on the Old Testament. Mohammed employed the same concession for meat-eaters as God did in the scriptures and the same techniques of gradualism. Although total compassion and abstinence from killing were the ideal, Mohammed had to bring his followers to that platform slowly so as not to repel potential adherents. Mohammed knew his people well. Before the advent of Islam, the people of Arabia embraced a plurality of gods, bigamy was the rule, if a baby girl was born the couple out of shame would bury her alive (Koran, surah 6, verse 140). Sexual relation between mothers and sons were so widespread that the Koran contained prohibition (Koran, surah4, verses 19-24). It was Mohammed’s mission to uplift his people, but he knew that radical change was doomed to fail. Like the great religious reformers before him, Mohammed considered the time, place and circumstances surrounding his mission. In fact, Mohammed openly admitted that he only taught men according to their mental capacities:” For if you speak all things to all men-some will not understand.” In this regard, Mohammed said, “The teachings were sent in seven dialects; and in every one of its sentences there is an external and an internal meaning.... I received two kinds of knowledge: one of these I taught-but if I had taught them the other, it would have broken their throats.” Although Islamic tradition and Arabic Linguists have long since developed an explanation for the peculiar expression “broken their throats,” many vegetarian Muslim have suggested that vegetarianism is implied with this phrase. In fact, Mohammed could only have been in favour of vegetarianism, although he may have been unable to impose this philosophy on the majority. He always showed the greatest compassion-“universal compassion” –and he exhorted his followers to do the same. A touching example for Mohammed’s life show how far his empathy extended. Awaking from a nap one afternoon, he found a small, sick cat fast asleep on the edge of his cloak. The prophet cut off his garment so that the cat could sleep undisturbed. Such a man could never advocate the slaughter of innocent animals in the name of religion. In one popular tradition (Hadith) Mohammed is depicted as having rebuked his followers for not showing universal compassion. “But we do show compassion,” they insisted,”-to our wives, children and relatives.” The prophet responded, “It is not this to which I refer. I am speaking of universal mercy. One advantage of Islam’s being a newer religion is that many specific facts regarding Mohammed’s diet and attitude towards animals are well remembered and preserved. The prophet’s earliest biographers indicate that he preferred vegetarian foods, saying that he liked milk mixed with water, curd with butter or nuts and dates. His favourite fruits were pomegranates, grapes and figs. He was particularly fond of honey, often eating it mixed with vinegar, and he is quoted as saying that in a house where there is vinegar and honey, there will certainly be the blessings of the Lord. The Quran contains several references pertaining to vegetarianism, such as ‘Let man reflect on the food he eats, how we poured out rain abundantly and split earth and made fertile, and then we made the grains to grow and vines and reeds, olives and palms and gardens and pastures- an enjoyment for you and your cattle to delight in. ‘Ultimately Quran encourages Muslims to eat wholesome, healthful vegetarian food. Al-Ghazzali (1058-111), one of Islam’s most brilliant philosophers, who wrote in his book “Ihya Ulum ul-din.” Eating the meat of a cow causes disease (marz), its milk is health (safa), and its clarified butter (ghee) is medicine (dava). Compassionate eating leads to compassionate living. The Koran clearly evokes compassion and mercy toward animals, and although many Muslims never consider vegetarianism, certain sects, such as the shi’ites, do have a core of vegetarian followers. Islamic mystics, such as the Sufis, also hold vegetarianism as high spiritual ideal. The Sufi Tradition: There is an ancient story about a woman Sufi, Saint, Hazarat Rabia Basri, who would regularly go to a particular mountain in the forest in order to meditate in perfect tranquility. When she would go, all the animals of the forest would come near to enjoy her good company. One day, another Sufi arrived. But as soon as he approached, all the animals ran away, as if in fear. Completely vexed, the Sufi inquired Rabia Basri, “Why do the animals run away?” Rabia countered with another question: “what have you eaten today?” The Sufi confessed that he; had eaten an onion fried in some fat. The wise Sufi woman concluded, “You eat their fat! Why should they not flee from you? This famous Sufi tale is perhaps indicative of the Islamic mystical perspective on human-animal interrelations. Thousands of Sufis have advocated vegetarian food. Another great Sufi Mohammed Rahim Bawa Mohiyuddin in his monumental work “Come to the secret garden” talks about love and compassion towards animals. The hunter learns compassion from a bird represents a clearly vegetarian tradition within Islamic mysticism. Hinduism, Buddhism and Jainism: Needless to say that the Indian religious traditions have always advocated vegetarianism, The Vedas do speak for sacrifice of different animals on different occasions, but popular modern Hinduism does not advocate animal sacrifice. The Hindu scriptures always speak about vegetarian way of life. Manusmruti says; “having well considered the origin of flesh foods, and the cruelty, of fettering slaying corporeal body let man entirely abstain from eating flesh” Manusmriti 5.49 “by not killing any living being, one becomes fit for salvation” Manusmriti 6.60 “You must not use your God given body for killing God’s creatures, whether they are humans or animals” Yajur Veda 12.32 As I have said earlier that Judaism is the mother of Semitic religions, there is nothing wrong if I say Hinduism is the mother of eastern religions especially Jainism and Buddhism. No religion of the world has given such high a place to AHIMSA as Jainism has.